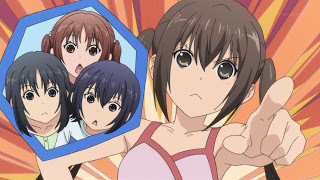 Uchida, Touma, and Yoshino are at the female Minami residence for a visit when Touma expresses regret at not having gone to the beach. As such, Kana puts her into Chiaki’s frilly bathing suit. 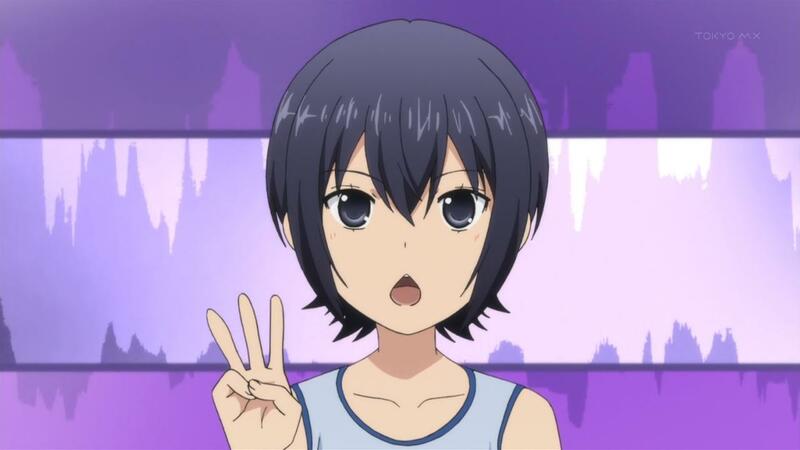 Uchida regrets not having gone on an overnight trip, so Kana arranges for the group to spend the night. 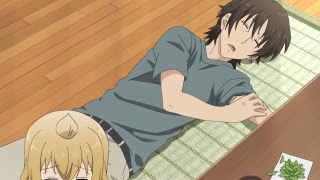 Since it is hot, Uchida can’t sleep. Kana suggests ghost stories to Uchida and Chiaki, leading Chiaki to get everyone up to share the scare. 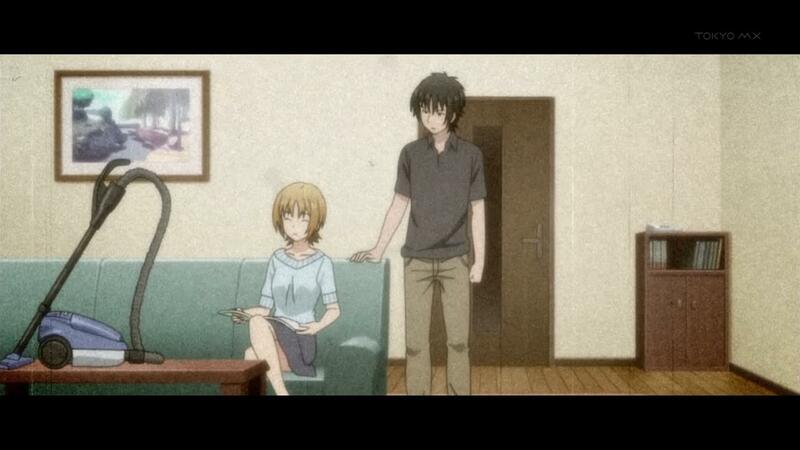 Haruka can’t stay awake, so she falls asleep as Touma gives them a choice of three household appliance ghost stories. They choose the one for the vacuum, but then Touma can’t remember the story. Uchida attempts the tale, using Hosaka and Hayami as the young married couple, but she ends up mixing her story up with one about miso soup. 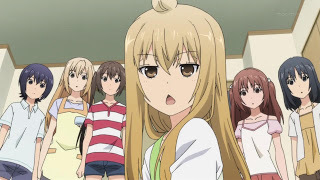 Moaning is heard, causing Yoshino to remark that ghosts come if you talk about them. The sudden rising and loud moaning from Haruka scares the girls, causing Chiaki to faint. Haruka starts to tell them her dream, but then can’t remember it, only recalling something heavy being on her (Chiaki). With that being a bust, it is suggested that they talk about guys they are into. Haruka says they can’t, then goes along with it. 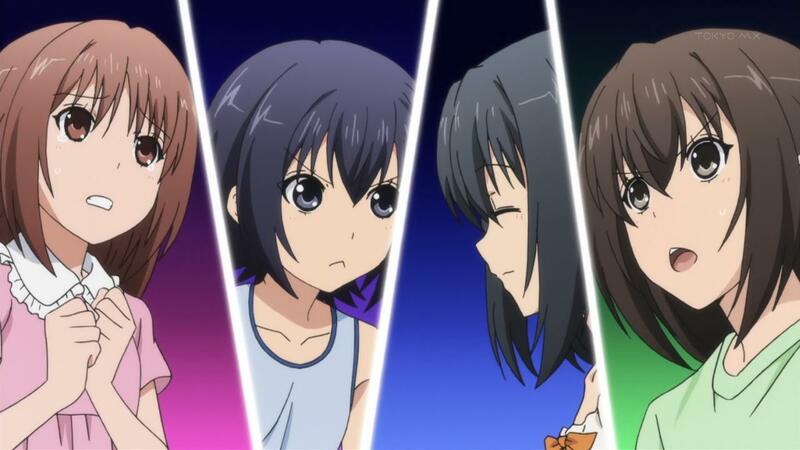 The group decides that Haruka should go first, much to her surprise. 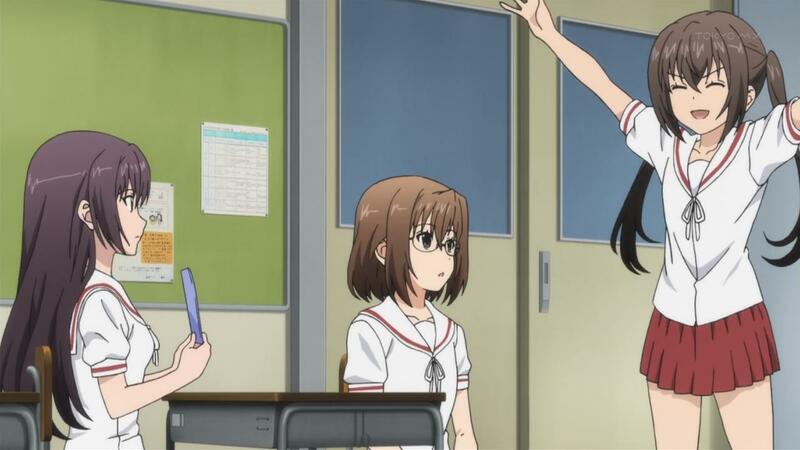 At school, Keiko and Riko lament the heat when a cheerful Kana comes in. When asked how she can be so cheerful when it is so hot, Kana gets depressed, having managed to earlier distract herself from the heat. Keiko promises to buy Kana an ice lolly (Popsicle), but she has a winning stick and is reminded that her tooth hurts. She gives the stick to Keiko and Riko, but they don’t want it and end up giving it back after failing to pass it on. At home, Kana writes something on the stick and opens her desk drawer to put it in, only to find a winning stick from last year. Since this reminds her of her tooth pain, she gives the sticks to Haruka and Chiaki, who get free ice lollies. Takeru is over, having the day off with pay, so Uchida, Yoshino, and Touma scope out this ojisan as he drinks beer and watches a soap on TV. Haruka gives Kana some edamame to give to Takerun for a snack. 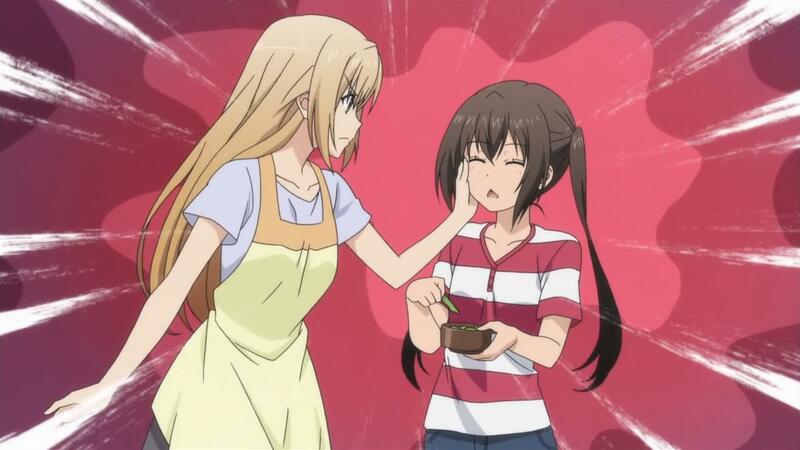 When Kana starts to eat some, Haruka smacks her, claiming there was a mosquito. Chiaki notes this, then ambushes Kana by whacking her with a hand fan, citing an instance where Kana ate her ice cream. Kana protests that she gave Chiaki a free ice lolly, but Chiaki points out the price difference in the two. This leads to a series of girls whacking other girls, claiming there’s a mosquito of various description. 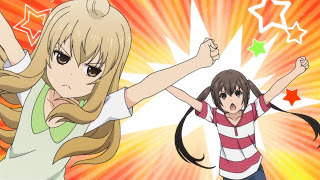 Kana tries to whack Chiaki but fails, though Chiaki trips on the napping Takeru. There, they discover a real mosquito has found its mark on his arm. Kana gets up late and is surprised to see Takeru over again. 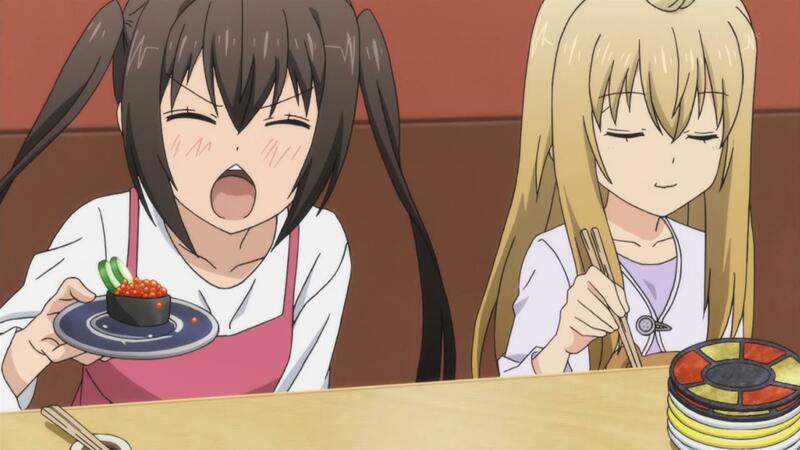 Haruka is out and Kana is hungry, but doesn’t want to do anything to make herself something. Chiaki hints at kaiten sushi, so Takeru takes them. On the way, they meet Touma, Yoshino, and Uchida, so Takeru says that they can each have up to ¥1000 of stuff. Chiaki explains the kaiten plate pricing system, then as the group starts grabbing and eating, Chiaki purposefully adds up her plate costs by half. In the end, the bill is ¥7000 and Chiaki consumed ¥2000 of food. She says it was the teddy bear Fujioka’s share, which Takeru rejects. So, Chiaki is forced to give Takeru a massage when they get home. When Haruka finally gets home with groceries, she’s depressed when she learns they went for sushi, causing Takeru to invite her for sushi. Touma often reminds me of Ryuunosuke from Urusei Yatsura in that she’s a tomboy and very much into guy things. 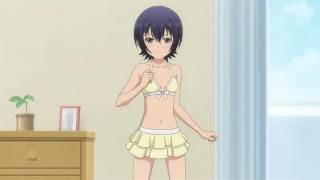 However, unlike Ryuunosuke, Touma isn’t much for female clothing. As such, I was surprised when the production team decided to do some Touma fanservice and put her into a two piece bathing suit. Using Hosaka and Hayami in Uchida’s cheesy ghost story made me laugh, mainly because they were being used in such an atypical way. I also laughed at the mosquito excuse for the girls to start whacking each other and taking out grievances, including ones from previous episodes. 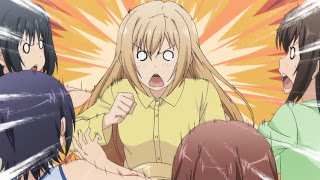 It was also funny that Yoshino was the only one to not get whacked after Touma chickened out and whacked Kana instead. Takeru finally makes an appearance. To be honest, I’d completely forgotten about that guy, but I’m glad the production team hadn’t forgotten. 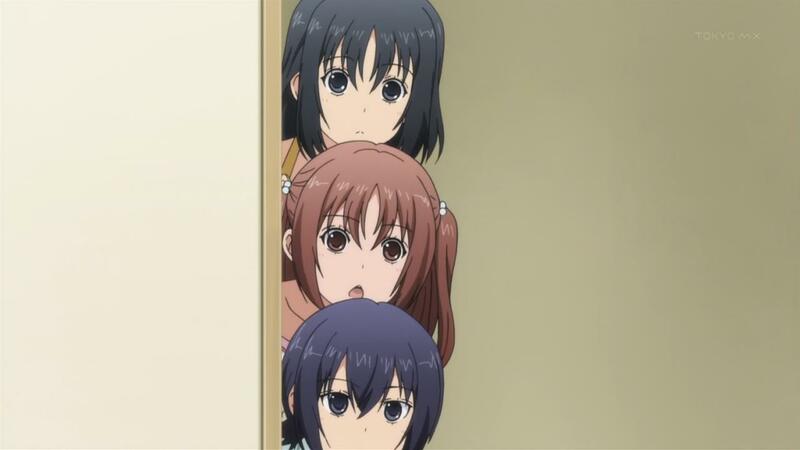 I was amused by Uchida, Touma, and Yoshino spying on him in that way that elementary school girls do when they see a guy they consider handsome, but don’t know how to approach him. The kaiten sushi story didn’t make me laugh, but it was amusing. Were I into sushi (there are some things I don’t mind, but on the whole, I’m not a sushi fan), there’s a kaiten place within driving distance of where I currently live. It is pretty nice from what I’ve heard from those who’ve made the trip, but as I said, I’m not a sushi guy. Anyway, back to the episode, I find there’s not a lot else to comment on. 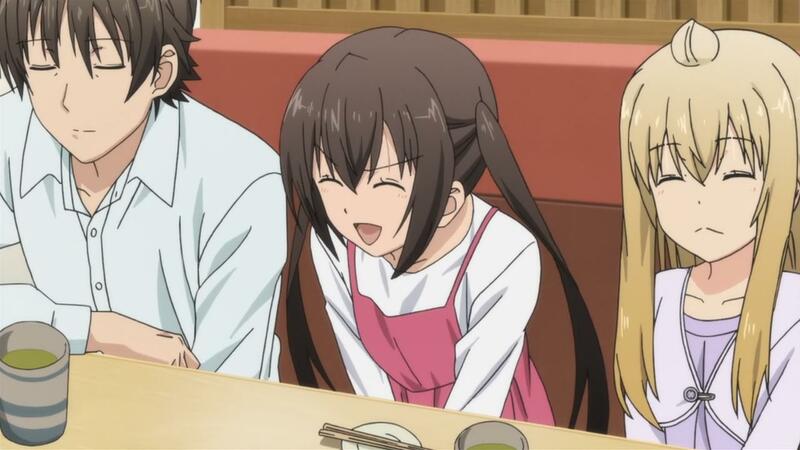 As is the case this series, I enjoyed myself a great deal as I watched the Minami-ke fun happen. I’m really glad this current series has been so good.